Beat together oil, egg, sugar and vanilla and add to buttermilk/bran mixture. Sift together flour, baking soda, baking powder and salt. Stir flour mixture into buttermilk mixture, until just blended. Fold in raisins and spoon batter into prepared muffin tins. 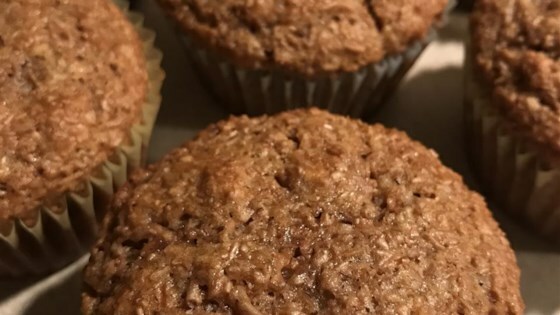 These muffins are full of fiber, yet are also moist and very tasty. Yummy! I used 1/2 cup dried cherries but think it would have been even better with 3/4 cup. Can't wait to try these with dried strawberries, blueberries or cranberries!